A new Samsung Galaxy S5 Android 4.4.2 update is now being pushed to users, so if you happen to own a GS5 you should keep an eye on the notifications bar. According to the folks at Sammobile the new Android 4.4.2 update for Samsung Galaxy S5 is currently being rolled out for the European variant of the smartphone. Even though Samsung was expected to update the Samsung Galaxy S5 to Android 4.4.4 or Android 4.4.2 this month, it looks like the South Korean phone maker choose to roll out another Android 4.4.2 update. The new firmware has a size of 194 MB and its said to bring performance improvements. Given the size of the update file, the improvements might be substantial, so the Galaxy S5 might actually skip Android 4.4.4. Because the Galaxy S5 was launched pre-loaded with Android 4.4.2 out of the box, all the KitKat-specific goodies such as transparent status and nav bars, white status bar icons, new Location menu, immersive mode, cloud printing or color emoji support were included out of the box. 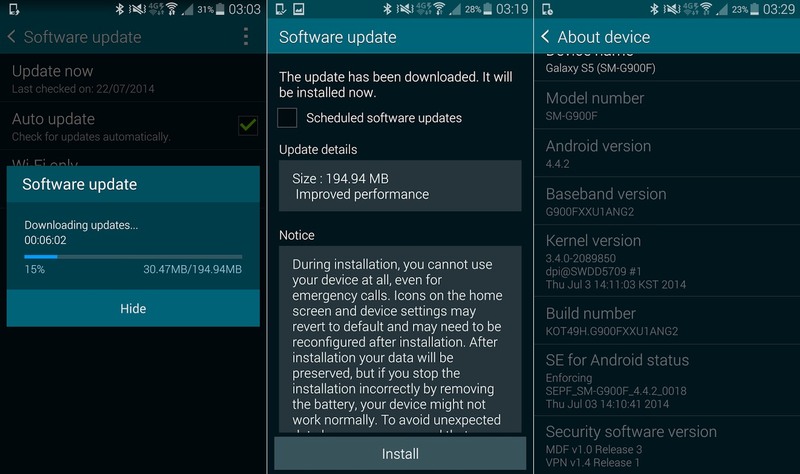 As usual, the new Samsung Galaxy S5 Android 4.4.2 update is being rolled out in phases, which means that some of you might not be able to download and install it right away. Once your device will become eligible to receive the new firmware, you should be able to see a system update message in the notifications bar. Tap on it then follow the on-screen instructions. If the system update notification failed to appear, you would also want to perform a manual check under Settings > About phone > Software updates > Check for software updates. Alternatively, you can grab the USB cable, connect the smartphone to the PC, and check for the update via KIES. Those who cannot wait for the official release and wish to install the G900FXXU1ANG2 manually on their devices may follow our step-by-step guide, courtesy of Sammobile. The latest build is an unbranded version of firmware and can be installed on any unlocked SM-G900F unit. Kickedface reminds its readers that it will not be held liable for any damage to the device. Before installing the stock firmware, users are advised to verify their devices meet the following requirements. Install USB Drivers for Samsung Galaxy S5 to connect the Android device with the computer. As the tutorial is likely to wipe out all data of the phone, create a backup. If the device has any custom recoveries such as CWM/TWRP then back up data using the same. If the Android phone powers off due to lack of battery charge during the installation process, it could damage the device. Therefore, the Galaxy S4 should have above 80% battery charge. The phone will lose custom ROM with the installation of official firmware. Also, the custom recovery will be replaced by the stock version. 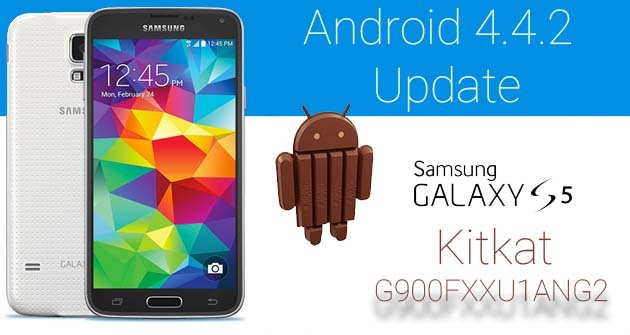 G900FXXU1ANG2 Android 4.4.2 KitKat official firmware works only with Galaxy S5 SM-G900F. As flashing this on any other variant might brick the device, verify the model number of Galaxy S5 by navigating to Settings>> About phone>> Model number. Note: If the Added message does not appear, then try to re-install USB derivers or change the USB port on the computer. Galaxy S5 users can now enjoy improved performance with the G900FXXU1ANG2 Android 4.4.2 firmware. Head over to Settings>> About phone to verify the new firmware version.